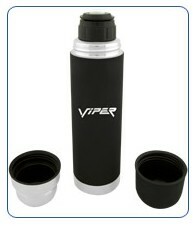 Inexpensive wholesale rubber thermos, custom imprinted with your logo or message. We also supply wholesale blank (not imprinted) rubber thermoses for $6.59 each. Budget Prices in the USA and Canada for wholesale rubber thermoses. Prices include a 1 color, 1 location screen imprint. Setup Charge is $40.00 per color. Add $0.25 per thermos for laser engraving.You may order any in-between quantity; If you require additional colors or imprint locations, then you have to add $0.25 per color, per imprint location, per unit, plus an additional Setup Charge of $40.00 per color, per imprint location. American clients pay no taxes, Canadian clients don't pay PST. We will send you a proof for your approval before production. Add $0.25 per thermos for laser engraving. Typical Production Time: 7 days afterartapproval; 3 days rush production is available: contact us. A 16 ounce double wall constructed thermos - thermal flask with a stainless steel interior and stainless steel exterior. The exterior is rubber coated for a soft luxurious look and feel. Rubber coating adds extra insulation and more grip. Includes 2 blank cups, one nestled in the other. There is a leak proof, push on/off locking stopper for easy pouring. Individually packaged in a white box. Weight : 21 lbs/20 pcs.